Within a mile of this location, Metacomet, also called King Philip, and his men were ambushed by Captain Benjamin Church of the Plymouth Colony on August 12, 1676. Church had followed Metacomet to his long-time stronghold on Montaup (Mount Hope) after two years of heavy fighting between Colonial and Native forces dubbed "King Philip's War" (1675-1676). In the "Miery Swamp" near Mount Hope Bay, Metacomet was shot in the heart by John Alderman, a Native man fighting for Captain Church. Falling face down in a small stream, Metacomet took his last breath on lands that he knew well. Metacomet was then beheaded and quartered¬-a truly barbaric act. His body was strung in the trees so his remains would be scattered. From Mount Hope, Metacomet's head was sent to Plymouth, one hand was sent to Boston, and Alderman was given the other. 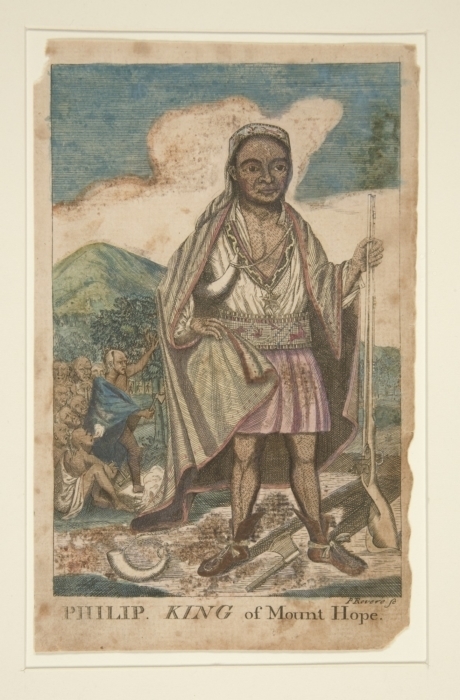 Metacomet was the younger son of the Wampanoag Massasoit (Great Sachem) Ousamequin. Metacomet was born before 1640 and had an elder brother, Wamsutta (Alexander) and at least three sisters. When their octogenarian father Massasoit died in 1661, his eldest son, Wamsutta became the Chief Sachem. Wamsutta and Metacomet married a pair of sisters, with Wamsutta marrying Weetamoo and Metacomet marrying her younger sister, Wootonekanuske--two daughters of the Pocasset Sachem Corbitant. In 1662, Wamsutta was called to Plymouth to answer conspiracy charges. On his return home, he became ill and died shortly thereafter with rumors of a poisoning among many. Metacomet, the newly instated Sachem, grew to despise the English for the death of his brother and other cultural and political issues. When Swansea was settled in 1667, Metacomet fumed. Swansea was settled on land that the English did not own. Moreover, the settlement was just a stone's throw away from Montaup. When the English learned of Metacomet's anger, they forced him to surrender his firearms. The United Colonies denied his claims of appeal and imposed such a heavy fine that he was forced to sell the Wampanoag lands in Swansea. The final straw came in 1675 when three Wampanoag men were executed for murdering John Sassamon, a Christian or "praying Indian." Sassamon was an English informant who had recently warned Plymouth of a brewing Indian uprising. By 1675, Metacomet had gathered Native allies across the region to fight English colonists. While much of the fighting occurred in Massachusetts, Rhode Island did not go unscathed. Metacomet's forces attacked Pawtuxet, Warwick, and Providence. Roger Williams' Providence home was destroyed in the early months of 1676. Local tribes, like the Narragansett, were immeasurably impacted by the conflict. During the war, most "praying Indians" and other Native people were rounded up and sent to Deer Island in Boston Harbor. John Eliot and Daniel Gookin, a missionary and Major-General, were so disturbed by these events that they attempted to ferry supplies to Deer Island, for which they were both nearly hanged. In late 1676, Metacomet's wife Wootonekanuske and their nine-year-old son were captured by Captain Benjamin Church and sold into slavery in the West Indies, along with many other Native prisoners. 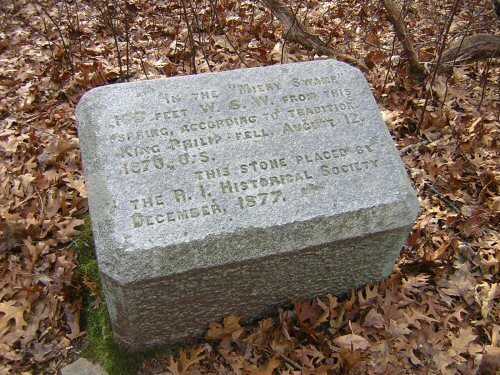 Marker near the Site of Metacomet's Death in Bristol, RI: This stone marker was placed at the site of Metacomet's death in 1877 by the Rhode Island Historical Society. 18th Century King Philip Engraving: Engraved by by Paul Revere, "King Philip" (or Metacomet) was created in 1772 for Benjamin Church's "The Entertaining History of King Philip's War". 250 Metacom Ave. Bristol, RI 02809 ~ If you'd like to visit King Philip's Seat or the Miery Swamp, feel free to check in at Mount Hope Farm and ask for directions. Weetamoo Woods are named after Metacomet's sister-in-law, Weetamoo, who became Sachem of the village at Pocasset in 1662 after her husband, Wamsutta, died. Weetamoo helped raid Lancaster, Massachusetts, and is infamously depicted in Mary Rowlandson's captivity narrative from King Philip's War. After Metacomet's death in 1676, all remaining Native leaders were hunted down, including Weetamoo, who drowned in the Taunton River trying to escape the English. Every year, Native people make a pilgrimage to Deer Island to remember and honor those massacred during this tumultuous time. The Wampanoag also visit the site of Metacomet’s death in Bristol, often on Memorial Day. Read more about the Pequot War, the assassination of Miantonomi, and King Philip’s War in Hubbard’s A Narrative of the Indian Wars in New England (1803). Katharine Kirakosian and Tomaquag Museum, “Metacomet,” Rhode Tour, accessed April 21, 2019, http://rhodetour.org/items/show/295. Lepore, Jill (1999) The Name of War: King Philip’s War and the Origins of American Identity. Vintage.